The black and white cinematography of Gordon Willis and the music of George Gershwin make for a pitch-perfect valentine to the Big Apple. Stars: Woody Allen, Diane Keaton, Michael Murphy, Mariel Hemingway, Meryl Streep, Anne Byrne. 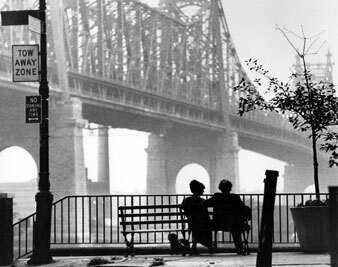 OK, Woody Allen’s falling for a high-school student may be a little too close to reality, but the black and white cinematography of Gordon Willis and the music of George Gershwin made for a pitch-perfect valentine to the Big Apple. Woody Allen, now going under the name of Isaac Davis, hasn’t changed much since we last met him in Annie Hall. He is still, in Manhattan, the quintessential New Yorker, exhausting his days and nights in a treasure hunt for the meaning of life, which he believes must surely be hidden somewhere east of Fifth Avenue. Allen/Davis is his own guru; hard on himself, hard on his friends. Moral certainty is his grail, and when we meet up with him this time he is having an affair with Tracy (Mariel Hemingway), a lovely, not excessively bright high school girl of 17, which liaison is not only inappropriate for a man in his mid-40s but an offense against the laws of New York State. Davis keeps telling her that she is wasting her time, that there’s no future in it, that she ought to take up with someone her own age, who could make love to her properly— though, as he hastily adds and she happily agrees, he is not so bad at it himself. However, Mary decides that, on balance, she rather prefers Yale to Davisa— Hobson’s choice, I would say, for a young woman on her own in Manhattan—and at the end, the seeker after life’s meaning is at Tracy’s door, trying to persuade her, as the taxi waits, to abandon her six-month drama course in London and cleave once again to him. Six months, she says with the optimism of youth, is not a long time, and he must have faith. Whereupon a look of beatitude illuminates Allen’s face, and off she goes. My bet is that when we next meet him, Woody Allen will still be jogging on the epistemological treadmill. I hope I’m wrong. There is a good deal of honest concern in Allen’s wrestling with the Angel, not to mention that he is a man of uncommon charm and wit. But the theme is beginning to wear thin and to look fashionable. Davis, for example, has left his wife because she has taken a Lesbian lover; he frets about the rearing of their son and takes offense at a book she has written detailing his inadequacies as a mate. At one point, also, he remarks that he and the people he knows invent neurotic crises to shield themselves from blacker holes their psyches dare not contemplate, and in a moment of depression he recites to himself for encouragement a roster of the delights that make life endurable—a kind of Zabar’s shopping list of human achievement. This sort of thing suggests that the trouble with Allen and the people he knows is that they all read the same pop culture articles in the same OK magazines. The musical score of Manhattan is a medley of George Gershwin tunes, and you can’t do better for background music. But Gershwin is also nostalgia, the currently fashionable balm for what hurts us. All in all, I doubt that Allen can get much further by plucking obsessively at his own bosom. He is a great performer, and it must be a temptation to stay out there in front of the camera. But I don’t think he can go on playing the lonely runner of the East Fifties. Interiors, for all that it hid its irresolution in reflections, was an interesting film. Perhaps Allen should have another go at other people’s lives.